Make fitness a habit this year. OptiMYz magazine and Sally Leung present: The 1-Minute Fitness Challenge! Make fitness a habit starting on January 2nd, 2017! See Official Rules below for more details on how you can win a pair of Skechers shoes and a full year subscription to OptiMYz! Take the five-minute fitness test any time between now at January 2nd. Measure your progress with the tracking sheet, available here. We will post an exclusive exercise from trainer Sally Leung each weekday on Facebook and Instagram. Do each move for just one minute. By Friday, you’ll have a five-minute, full-body circuit. On Monday, we start all over. By January 31st, you’ll have an arsenal of 20 body weight exercises to play with and four weeks of habit-forming to carry you through the year. We will also be giving away a weekly prize of a one-year subscription to OptiMYz magazine as well as a pair of Skechers shoes to four lucky winners! Just follow us on Facebook and Instagram and join in the fun by tagging us in your progress pics and using #FitInAMinute. You’ll automatically be entered into the weekly contest! See Official Rules below for more details. Sally is a certified personal trainer and nutrition specialist who has coached and trained everyone from complete beginners to fitness cover models. She is also a Ms. Bikini Universe Pro, cover model, and the host of her own TV show Get Fit, Get Strong. Sally is committed to providing the tools needed to help everyone live their healthiest lives through her signature program The Bikini Body Method. More information on Sally and her programs can be found at www.SallyLeungFitness.com. 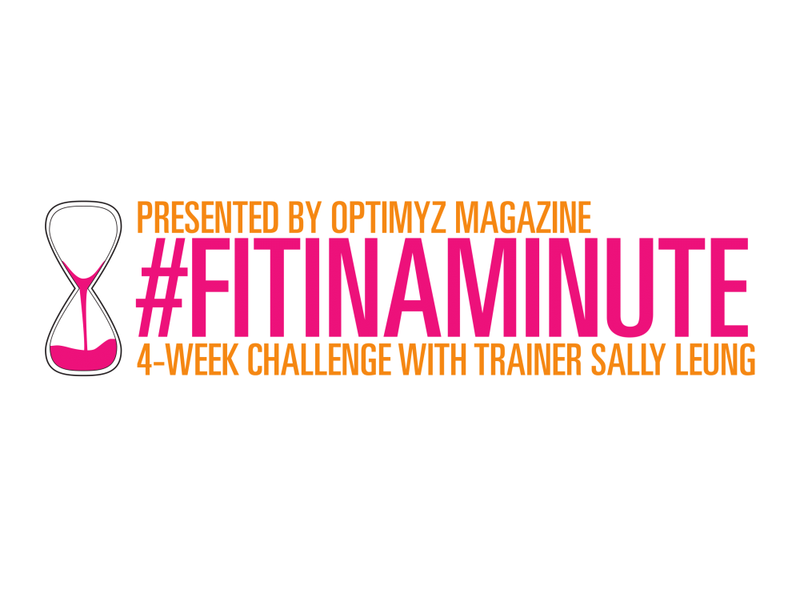 » Like and comment on a #FitInAMinute post from @OptiMYzMagazine. » Like a #FitInAMinute post and follow @OptiMYzMag, @SallyLeungFitness and @skechers.canada. No purchase necessary. This contest is only open to residents of Canada. Winners will be announced on OptiMYz magazine and Sally Leung’s Facebook page and Instagram account. You must respond to winning announcement within 48 hours. One winner will be picked at random on each of these dates: January 13th, 20th, 27th, and 31st. Each of the 4 lucky winners will receive a pair of Skechers shoes and a full year subscription to OptiMYz Magazine. Contest closes on January 31st at 9am EST. This promotion is in no way sponsored, endorsed or administered by, or associated with, Facebook or Instagram. Ultimate Fighter TJ Grant demonstrates his individual workout plan.